I love to make my own nut butters, my favorites being cashew, pecan and coconut or a combination thereof, but nothing tops the chocolate version. I try not to make it all too often because it disappears so fast—an attempt to save me from myself I suppose. While this homemade version has a different texture than the name-brand chocolate hazelnut spreads of the world, you’ll be delighted to know that this version contains just 3 ingredients, none of which are derived from GMO soy or corn byproducts. In fact this butter is packed with nutrition—magnesium, protein and monounsaturated fats—and the main ingredient is (!) nuts, not sugar. I’ve used a combination of hazelnuts, cashews and pecans here but you could really use any nut, seed or combination you like. Almonds are a good stand-in for the hazelnuts and are less expensive and easier to find. You could easily make half a batch too if you think you won’t eat it quickly enough (as if that would happen). I own a food processor and a Vitamix. 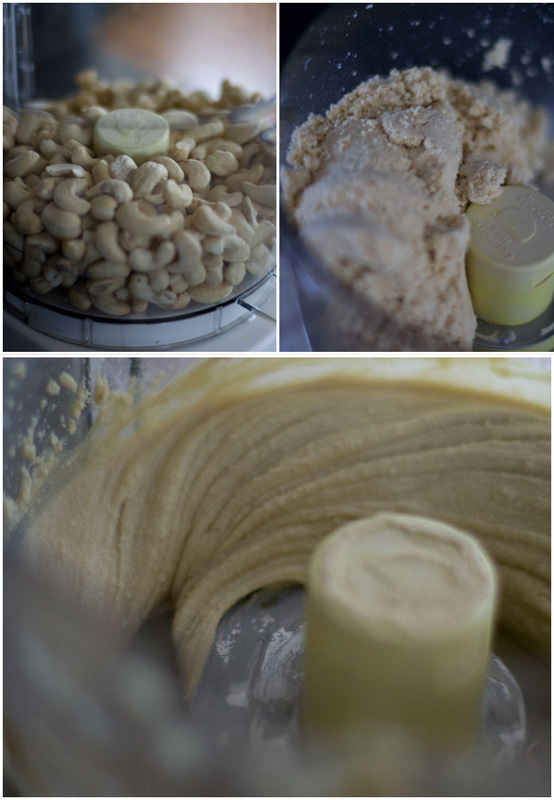 You can use either to make nut butters, but I prefer to use the food processor. Although the Vitamix makes short work of grinding the nuts into butter, I find that the texture is better and the oils release from the nuts when using the slower food processor. That and you can get every precious bit out with ease—in the Vitamix, not so much. If you do use a high-speed blender make sure you use a tamper and don’t let the nuts get too hot. If you don’t have a food processor or a high-speed blender (homemade nut butter at you finger tips is reason enough to invest in one! ), you could get a really good arm workout chopping them fine and grinding with a mortar and pestle. If you try this route you are a brave (and strong) soul and should be greatly rewarded for you persistence with a fine machine to add to your cooking arsenal. Making nut butter is a fairly straight forward process—roast nuts, process in food processor, add flavorings—and after you’ve made it once or twice you’ll be a seasoned pro. But there is a catch, a secret ingredient if you will. 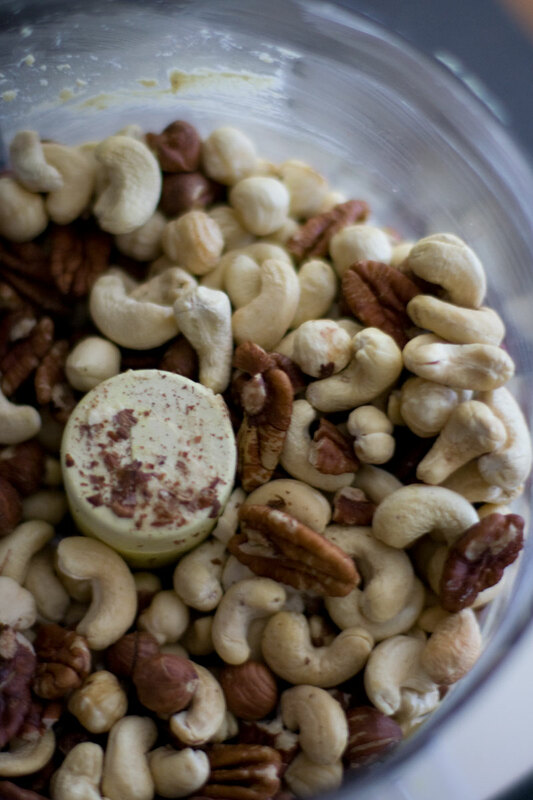 The secret ingredient to making a smooth, delectable nut butter is… patience. Disappointed? Well the reason I point this out is that many people give up on homemade nut butter too soon. The nuts will form a dry pasty ball at first that you should periodically break apart (which also gives your motor a chance to rest and cool a little). It will seem like it’s taking forever and this is when many people give up. Rest assured – after 10-15 minutes of processing, the oils will start to warm and release. The dry ball will gradually diminish until the butter forms a ring around the bottom of the processor. At this point, scrape down the sides and add in the flavorings (in this case sugar and cocoa powder). Pulse a few times, scrape down the sides again and process for a few minutes more. 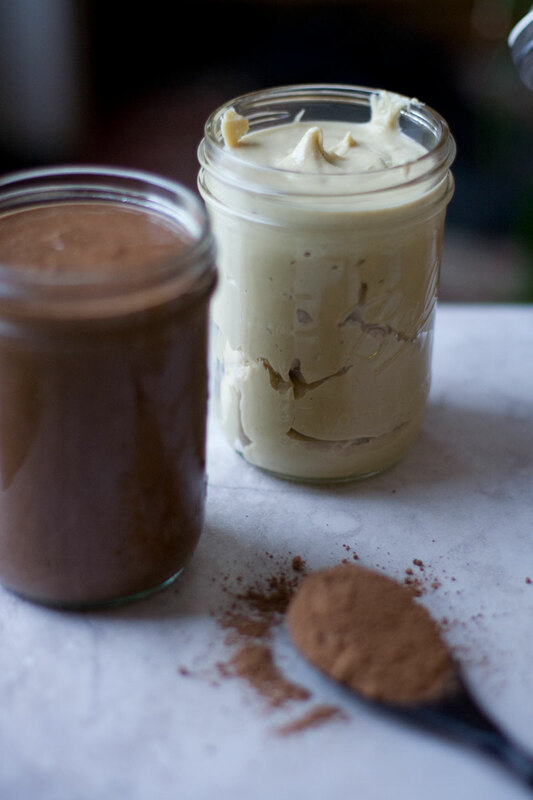 And there you have it: The secret to making awesome homemade nut butter. Hazelnuts and filberts are very similar in flavor and nutritional profile, but they are actually two different varieties of the same species. Hazelnut trees (native to North America) can grow up to 30 feet tall, whereas the somewhat larger filbert (native to Europe and Asia) grows on more of a shrub. Regardless, you can use them interchangeably in most recipes. Like most nuts, hazelnuts are high in protein, fiber and fat making them an excellent snack or addition to any meal. Besides the well-rounded macronutrient profile, hazelnuts are also an excellent source of vitamins E, B6, B1, B2, copper, magnesium, iron, zinc and calcium. 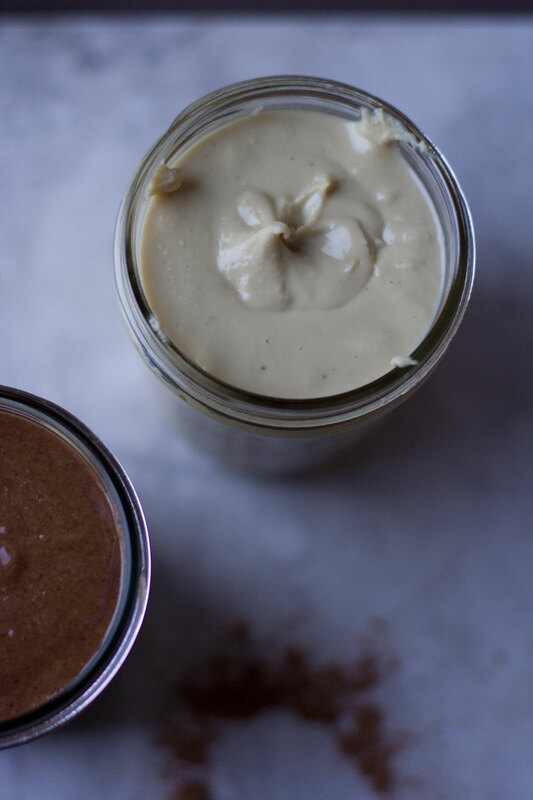 You can’t go wrong adding hazelnuts to your diet, but if you can’t find them or they’re too expensive, don’t let that stop you from trying your hand at homemade nut butter. You’ll never go back to that sugary concoction they sell in stores. Can they really call it hazelnut spread if there’s more sugar and oil than hazelnuts? Murray, Michael and Pizzorno, Joseph. The Encyclopedia of Healing Foods. New York, Atria Books. 2005 p 428. Print. Spread nuts out on a backing sheet and bake for 20 minutes, until lightly golden and fragrant. Set aside to cool. 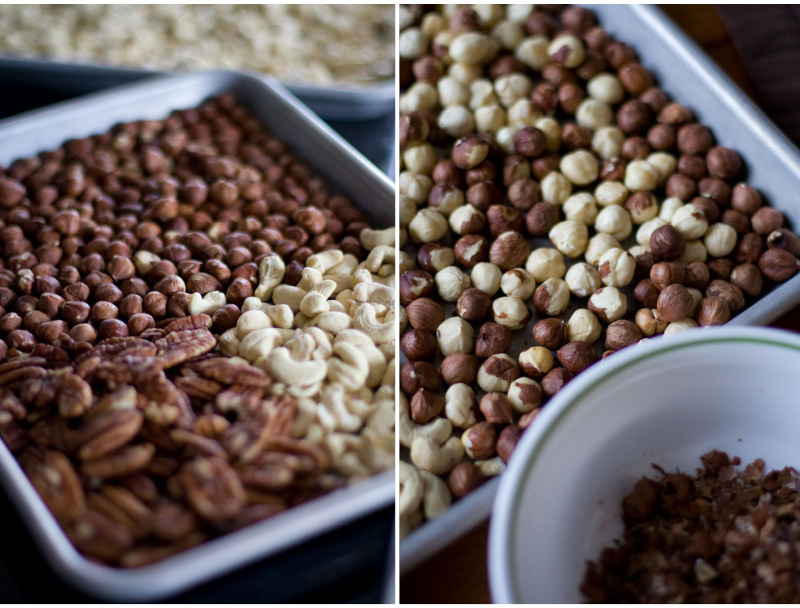 When nuts have cooled, transfer to a food processor and process, scraping down the sides once or twice until a ball forms. Break the ball apart and process again. Keep breaking apart the ball, scraping the sides and processing each time. After 10-15 minutes the ball will start to soften and lose shape. When the butter forms a smooth ring around the bottom of the processor, add the cacao powder, coconut sugar and salt, if using. Pulse and scrape down the sides. Now process a few minutes more. Taste and add extra cacao and sugar to desired flavor. Success! Thanks so much for subscribing! ©2014-2016 Sheena Scott, all rights reserved.